I’ve stupidly never paid attention to putters although that’s the most most important part and club in the bag. Recently though, I stumbled on pics of a Machine and sent Chris an email to inquire… the rest as they say is history and you can see the pics below. This is the M2A converter with Heavy Blade back finished in Hot Salts Gun Metal. I thought I’d like to accent that with some copper to contrast and with the good counsel of Chris and Jim Vincent and Dave, opted for a copper skeletonized pill cut PN, copper spacer and medallion. But that’s not all, I wanted it to look even more special and as a team, we decided for a half cut Bongo in the flange. The screws in the bumpers of the flange have been colored to match the copper and credit to the detailed eye of Dave, he also colored the screw in the sole which holds the neck and also darkened the screws to provide contrast to the copper medallion. I totally missed these details when confirming the specs and thank Dave for picking up on these very important details. For a piece like this, I think details are especially important. I opted to name this putter Casanova which Dave hand stamped in dancing letters so nicely. The paint fill for this and the sightline have been finished in a color matching the copper accents. A beautiful touch to a beautiful putter. Performance specs wise, as this is a carbon steel putter, I was concerned about it being overly soft. I have also found that I am more comfortable with horizontal styled milled faces. In consultation with Dave and his team, I opted for TMG 32. Headweight is 355 grams, loft is 3*, lie 71.5 and 4* open face angle. I have a flat black Vibrant standard shaft in it playing to 34 inches. Finally, I just want to say THANK YOU again to Dave, Jim and Chris! Casanova is my first custom putter and to help create it, the process, the education, all your involvement and guidance, (Dave’s involvement, Chris’ initial help and Jim’s great turnaround to my many inquisitive novice questions), all of your patience…. the journey has been fantastic and a great experience! I thought I should describe my experience with Machine when I bought my first custom putter. First a little info about myself, I am new to golf, started playing almost exactly 12 months ago (21,2hcp) but that didn’ t stop me from wanting a custom putter. I have been playing a Scotty Cameron until now. My craving for something different started when I saw that almost all my friends had similiar putters to my Scotty, booooring. Then I had to google custom putters and “abrakadabra” a new world opened up, Golf WRX and Puttertalk, I spent several hours surfing pictures and reviews and it didn’t take long until a had to order something. At first I decided not to go for a full custom (I had decided for a Machine though) so I ordered a Machine M20 Converter from the Doglegright website, the day after I changed my mind after more hours of surfing pics of putters. I then mailed DLR and they changed my order and I got in contact with Chris. I stayed true to the original choice of head but changed the material to damascus. Decided for a plumbers neck with pillcuts and a fatback flange and a billet spacer, five pillcuts in the sole to see more of the layering in the damascus. Two sightlines in the cavity and a skull sightdot wich Dave engraved (maybe a bit silly but I think it looks really good, it almost floats over the metal) I wanted the billet grip in anodized black and the UST FF shaft to end the package.I also decided to have my name engraved on the head, it is placed under the medallion. The whole experience of this purchase has been awesome. I might not be able to review the club fairly as I am this new into golf but I can review the process and the quality. Dave and Chris has booth been fantastic to deal with, it is a bit of a process to have a putter like this made for you and there has been several mails between me and Machine. This gives you the possibility to change your mind during the time, I did on some small things like paint fill, I originally wanted silver paint fill in the sightlines and skull and red in the ring on the Machine logo but when I saw the finish on the head after Dave acid etched it I skipped the paint fill not to ruin the extremely good look of the Damascus. Yes a Machine custom putter costs a good pile of money but they are IMO worth every penny several times over. The quality of the work on this putter is astonishing, it feels like a solid piece of metal and I have eyeballed it heavy for hoooouurs looking for flaws, there are none. Did my putter improve my putting? Maybe not but my “deadly putter” makes me happy when I play it and when I see it, actually I just want to shout “HEY EVERYONE COME LOOK AT THIS BEAUTY” and it feels great when I play. I am really really proud and happy over it and I think Dave and Chris should be to. Kind regards to Dave and Chris and to all of you “hoes” out there. 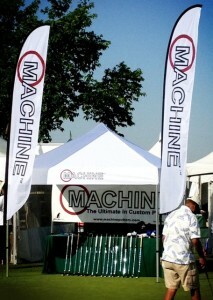 2013 Haggin Oaks Golf Expo in Sacramento, California. Woohoo!!!! Machine Putters in the house!!! Many a putter lover knows that Dave Billings at Machine makes some amazing putters. I couldn’t wait to see what they brought to share and so I thought I would share some with you.